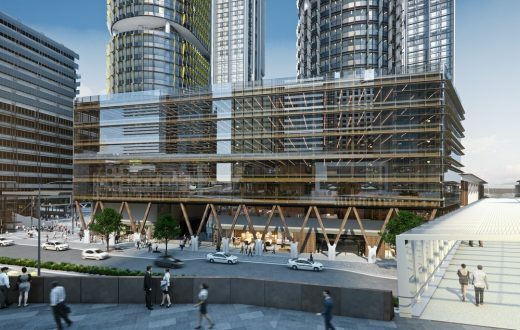 Construction of Australia’s first, and currently the world’s tallest engineered timber commercial building, International House Sydney, is now complete at Barangaroo South in Sydney and the building is preparing to welcome its new commercial and retail tenants. 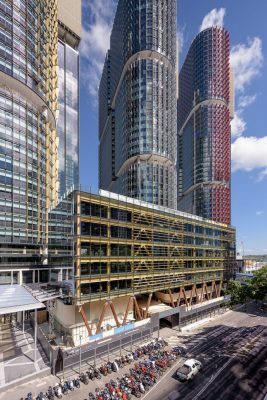 Designed by Tzannes architects for Lendlease, International House Sydney is a distinctive new element in the city, establishing a warm and welcoming connection between the new precinct of Barangaroo and the historic heart of the city. 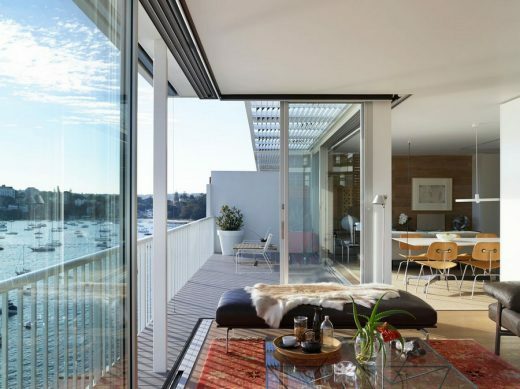 The most striking aspect of International House Sydney is that six above ground levels are constructed entirely from engineered or cross laminated timber, including floors, columns, walls, roof, lift shafts, egress stairs and bracing bays, supported by a single ground retail level of conventional concrete structure. The building explores a new form of beauty, one of unique and integral character, with outstanding green credentials. It expresses with aesthetic potency the fully exposed timber structure, stripped of additional layers of finishing materials. This is architecture that is detailed with rigour, made to last and not simply for ‘aesthetic effect’. Its intention is to become a long-term appreciating commercial asset, understood for its intrinsic, enduring beauty. Around 3,500 cubic metres of sustainably grown and recycled timber were used in construction. By not using concrete, thousands of tonnes of greenhouse gases were avoided. Importantly, International House Sydney demonstrates that the commercial real estate market will accept mass timber construction as a viable and exciting alternative to conventional concrete construction, increasing opportunity for architecture to contribute more effectively to a lower carbon and more sustainable future for urban development around the world. International House Sydney is designed as a distinctive element in the city, responding to and benefiting both the public domain, and its intended commercial users. 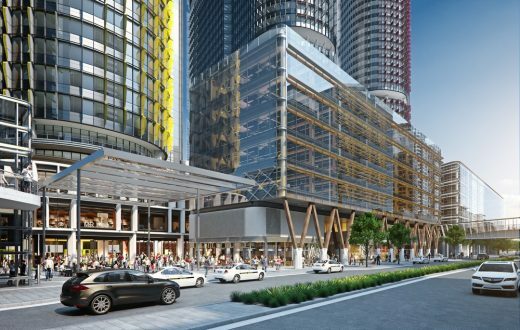 It includes a dramatic colonnade connecting the precinct to its entry point from the CBD, six floors of commercial space, ground floor retail level plus associated public spaces. 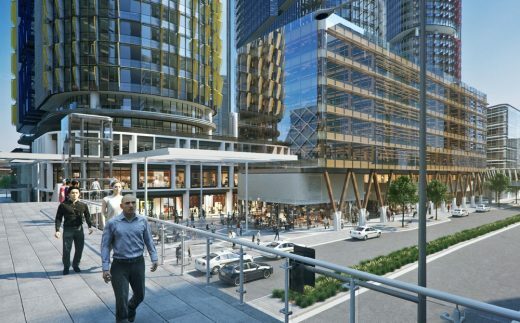 It forms the street wall to Hickson Road, complimenting and reinforcing existing buildings and providing a transition in scale to the towers at its west. The building has two components: a two storey base that responds to the scale of the public environment and includes the colonnade and Merchant Walk, and an upper five storey form, a clean simple glass envelope that allows the beautiful sculptural interior timber elements to be seen and enjoyed from both the inside and outside. Modern engineered mass timber is a sophisticated construction material. 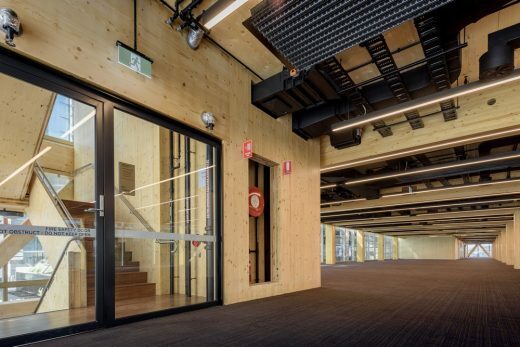 While light timber framed buildings are common in the Australian housing sector, the significant benefits of timber have not previously been scaled up and transferred to the Australian modern commercial building typology. 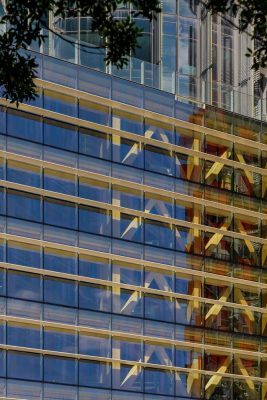 Technological advances in terms of industrialised high-tech manufacturing processes, prefabrication, connection systems and rapid site erection now allow architectural innovation and streamlined construction with this very versatile and traditional building material. Timber construction is potentially of great benefit to the planet. 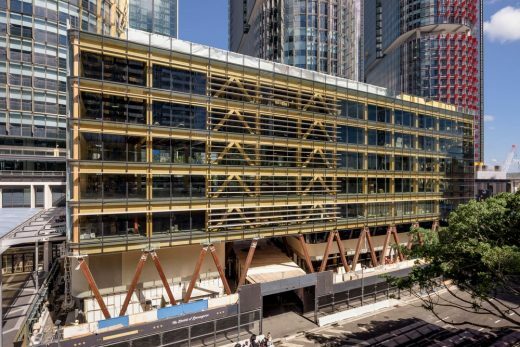 Rather than relying on conventional high carbon dioxide emitting and energy-intensive materials like ubiquitous concrete and steel, this building demonstrates that commercial buildings can instead utilise a non-polluting, carbon-storing material. 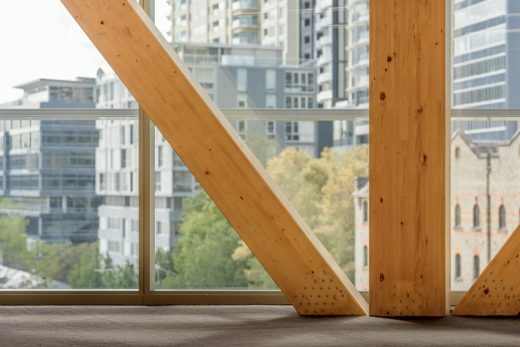 In contrast to half a tonne of CO2 typically being produced for every tonne of concrete formed, a single tree can absorb 1 tonne of carbon during growth and sequester it within the timber material, representing roughly half of its dried weight. 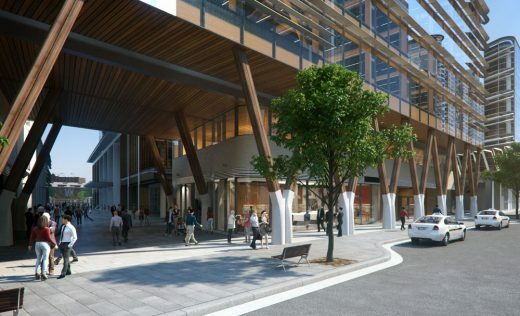 Timber construction offers possibilities that can benefit the city. Timber as a natural material evokes a connection to nature that is inviting and calming. Particularly important in high density urban cityscapes, this connection to nature fosters wellbeing for city dwellers, and offers a welcome break from the surrounding built landscape. International House Sydney’s unique use of recycled structural timber for the Hickson Road colonnade and the exposed engineered timber, provide such a break. The impressive large ironbark columns recycled from repurposed telegraph poles and dismantled bridges, retain their natural beauty and are reminiscent of the magnificent local Sydney trees. Timber construction also offers possibilities that can benefit the building’s occupants. 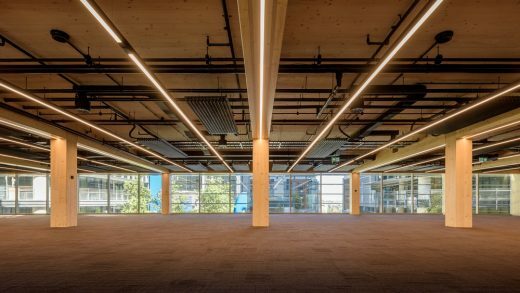 Timber can enhance the overall indoor environmental quality of commercial spaces. Providing an even more direct connection to nature, it adds humanity to spaces and is reminiscent of traditional craftsmanship. The International House Sydney timber interiors are appealing and warm to the eye, soft and natural to touch, offering a place of texture and variance where people can thrive, in contrast to more sterile and clinical finishes. An increasing body of research suggests internal environments that have natural finishes and a connection to nature are healthier and conductive to increased productivity and happiness in users. Another architectural benefit is the precision of design and detailing available with an upfront design process. The relatively large spans afforded by the material allow for spaces that are flexible yet precise at the same time. The assembly of many small pieces of dimensioned and graded timber provide a consistent, strong and predictable structural material. The precision of detailing also contribute to the speed of erection and safety limitations of structural and recycled timber drive the form of the building. Its grid is derived from the span and floor-to-floor height limitations of the structure. 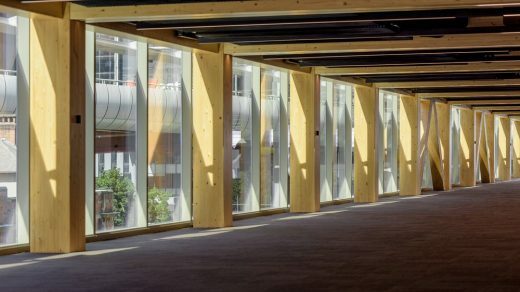 Recycled hardwood struts for V shaped columns along the colonnade are supported on muscular shaped concrete bases to provide the required building bracing and eliminating the need for a transfer structure over 12m wide Merchant Walk which passes through the building. The use of mass softwood and recycled hardwood at International House Sydney establishes an identity of place and reclaims a history of the site while referencing building craftsmanship.